Eva Goldschmidt reviews the book for H-War. David G. Atwill. 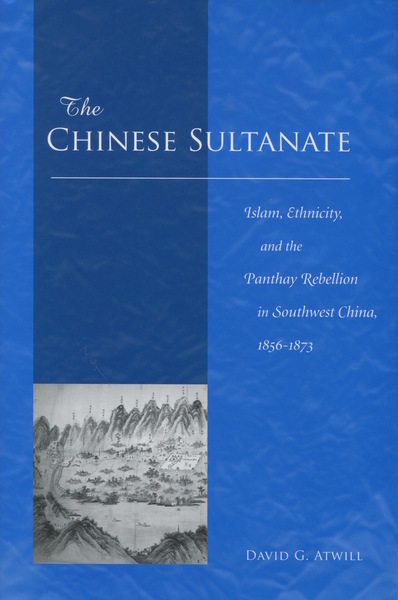 The Chinese Sultanate: Islam, Ethnicity, and the Panthay Rebellion in Southwest China, 1856-1873. Stanford: Stanford University Press, 2005. Reviewed by: Eva Goldschmidt, Department of Chinese Studies, Heidelberg University. The Panthay Rebellion took place between 1856 and 1873 in Yunnan Province, situated in the southwestern rim of China. Traditionally there are two strands of explanations why the Panthay rebellion took place: one claims that the uprising was rooted in deep-rooted Yunnan Muslim hatred of the Han Chinese, the other claims that the rebellion was purely religiously motivated. Atwill challenges both assumptions by analyzing the multi-ethnic and socioeconomic context in which the Yunnan Muslims lived and prospered before the rebellion, and how they expressed their regional identity, faith, and resistance during the years of the uprising. Some keywords need to be explained to facilitate the understanding of the specific circumstances of the uprising. British travelers to the Dali Sultanate and Yunnan baptized the uprising as the Panthay Rebellion. This designation is largely unknown to the Chinese scholarly world. The etymological root of the word is probably the Burmese pa-ti for Muslim. In classical and modern Chinese scholarship, the rebellion is known as the Muslim uprising or the Rebellion of Du Wenxiu, the founder of the Dali Sultanate and the foremost religious and political leader of that time. The Chinese word for Muslim is Hui, rooted in the ethnonym for Uyghurs at the northwestern border of the empire. In the narrow Yunnan context, Hui has a broad ethno-religious meaning, while the word mu-min stands for the narrow religious meaning of believer. Yi is a generic Chinese term for all the fifty-six indigenous minority groups living in the province. Their headmen were assigned Chinese seals and titles, and they were loosely connected with the local Chinese administration. In his first four chapters, Atwill introduces the reader to the geographic and economic frame in which the rebellion took place and which is vital for understanding further events and the course of the rebellion. The setting of the rebellion was Yunnan Province, the name of which means "South of the Clouds." This represented the most southwesterly outreach of Qing dynasty power. The province only became a part of the Chinese empire as late as the thirteenth century. Until the reign of Qing emperor Yongzheng (1723-35), large parts of the province were administered by indigenous headmen with very little interference by the administration in the provincial capital Kunming. The topographic peculiarities of Yunnan (high mountain ranges, no navigable rivers, no roads for wheeled traffic) caused and furthered the development of strong regional ties among the populations of the eastern, western and southern parts of Yunnan respectively. They reckoned themselves, foremost, as inhabitants of a specific region and then as Yunnanese. In historical treatises, Yunnan is described as the geographic union of a regional tripartite. This attitude had a lasting and decisive influence on the course and outcome of the rebellion. Economically the province was not heartland bound, but dependent on the caravan trade with Southeast Asia and Tibet. The rich copper mines in the east were of special interest to the Chinese government. The whole economy was based on a delicate balance between the Yunnan Hui, the indigenous Yi and the Han Chinese. The Hui followed the Mongol conquerors to Yunnan and engaged primarily and successfully in caravan trade and mining. Two factors destroyed the traditional living and working arrangements of the province: massive in-migration from the overpopulated provinces of the Chinese heartland and the abolition of the headman-system. The province's population surged from four million to ten million between 1775 and 1850. In stark contrast to former Han Chinese in-migrants, they were assertive of their own culture and their place in the society and economy of Yunnan and caused both major chagrin among the old residents and major environmental degradation. The imperial program of administrative consolidation caused further alienation between the indigenous Yi and the provincial government. In the following chapter, Atwill analyses three uprisings which took place between 1818 to 1833, initiated by Yunnanese Han-Chinese and indigenous groups to underpin his thesis that socioeconomic reasons affecting all traditional inhabitants triggered the rebellion. Chapters 5 and 6 describe the new quality and targets of the ever-spiraling violence and growing tensions within the province. Incidents no longer occurred at certain remote places and in a spontaneous diffuse manner, but were well orchestrated by the Chinese brotherhoods, took place in larger settlements and cities, and were solely targeted at the Hui minority and were followed by major bloodshed. The government officials and the local gentry for the most part supported the anti-Hui violence. Successive governors-general remained for too short a term in the province to investigate the incidents carefully and could punish only the worst riots. The bloodshed culminated in the Kunming Massacre of 1856, leaving eight thousand Hui dead and the whole province on the verge of anarchy. The provincial government's foremost task was to secure the access to the copper mines in the eastern part of Yunnan and avoid any encroachment on neighboring provinces. Chapters 7 and 8 describe the course of the rebellion and its main protagonists. Atwill provides ample evidence to support his thesis that the rebellion was a multi-ethnic uprising with strong regional characteristics. Ma Rulong was the leading military character of the rebellion. A military licentiate, he joined forces with Du Wenxiu and Ma Dexin to avenge the massacres among his religious brethren. From the outset, the rebellion revealed its major weaknesses. Since they had no unifying ideology, neither secular nor religious, each regional Hui leader fought with his multi-ethnic group of followers and pursued his private goals and ambitions. Ma Rulong was no exception to this rule. He refused any official position within the hierarchy of the newly founded Pingnan State, but returned to Kunming and laid siege to the city. Even though he was in the superior position, he surrendered in 1862 to the Qing governor general and accepted a position in the Qing military hierarchy. The Chinese sources offer no evidence as to why he threw his lot in with the Qing government. Du Wenxiu, the premier political and religious leader of the uprising, succeeded in establishing his own Pingnan (Pacify the South) state at Dali. He called himself Generalissimo of All Armed Forces and Cavalry in Chinese and Leader of All Muslims in Arabic. European travelers called him Suleiman. He had traveled in the Middle East and was fluent in Chinese and Arabic. Being very aware that his sultanate could only survive with the support of Han Chinese and the Yi groups, he offered them positions within his administration, made visible by newly created seals and uniforms, and the abolition of shaving the forehead. The economic basis of his sultanate was the traditional overland trade. Negotiations between Kunming and Dali ended in a stalemate because no party was ready to surrender. The sad end of the Pingnan State and the reassertion of Qing power is described in the final chapter of the book. Between 1867 and 1869, the short-lived Pingnan state reached the zenith of its power. It had strengthened its control over the eastern and southern part of the province and laid siege to Kunming. The defeat of the Taiping rebels enabled the imperial court to send more troops and a new governor general, Cen Yuying, who ended the siege and pursued the fleeing Pingnan troops to Dali. Du Wenxiu handed himself over to avoid major bloodshed among his followers. After his decapitation, Dali was razed to the grounds and the rebellion officially ended. Atwill's theses are based and supported by the widest array of Chinese and Western sources accessible. The records and analyses of Christian missionaries, who lived and worked in Yunnan for decades, are of special value and provide deep insights. Imperial edicts, official records, local gazetteers and British travelogues complete the picture. In other words, he has exhausted all the available sources. Open-mindedly, he has not selected one of the contemporary theories about inter-ethnic strife (or border strife) and arranged the facts neatly around it. He has also resisted the temptation to view the Panthay Rebellion as the beginning of a nascent Chinese crescent, stretching from the northwest to the southeastern border of Yunnan. Atwill's book about the Panthay Rebellion is valuable reading for persons interested in the economic and political history of minorities in China and their relationship with successive Imperial governments and in particular the history of Muslims in China. Citation: Eva Goldschmidt. "Review of David G. Atwill, The Chinese Sultanate: Islam, Ethnicity, and the Panthay Rebellion in Southwest China, 1856-1873," H-War, H-Net Reviews, January, 2007. URL: http://www.h-net.org/reviews/showrev.cgi?path=194151173981310. Republished with permission from H-Net Reviews.